My horoscope for today is very good! 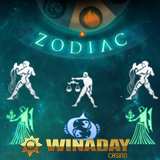 It says I'm going to get a $150 free chip at WinADay so I can try their new Zodiac slot game! WinADay Casino, which has been celebrating its eighth birthday all month, just launched this astronomical new game and is offering some of its best birthday bonuses yet. The new Zodiac has four bonus features that award lots of free spins and huge bet multipliers, and this week’s birthday bonuses include an up to $150 free chip. WinADay will also add 200% to all deposits until July 3rd. Details and additional bonuses for all slots, keno and video poker games are available at https://www.slotland.eu/en/promotions. These bonuses are valid June 23 to July 3, 2016. Bonus values depend on VIP status. Up to $150 free chip and 200% match bonus available to try new online slot game. Zodiac has 40 fixed paylines and four bonus features – Earth, Air, Fire and Water. Players can bet from 80 to 800 coins ($.80 - $8 per spin). The beautifully illustrated symbols on its five mystical reels are the 12 signs of the zodiac. Aquarius and Pisces are the highest value symbols paying out 1000X the bet for five of a kind. "The Elements wheel is really cool," said Michael Hilary, manager at WinADay Casino since it launched 8 years ago. "You never know which bonus feature you’ll hit – your fate is in the stars. But with all the free spins and multipliers they all pay out well, so all horoscopes forecast good fortune!" WinADay Casino now has 34 premium slots and 18 penny slots, most compatible with iPhones, iPads and Android smartphones and tablets.